← Bright Fast Moving Blue Light Turns, Brightens, Dims, Vanishes. Strange Object Found in Photo Taken by Game Cam. STRANGE OBJECT FOUND IN BACKGROUND OF GAME CAMERA. 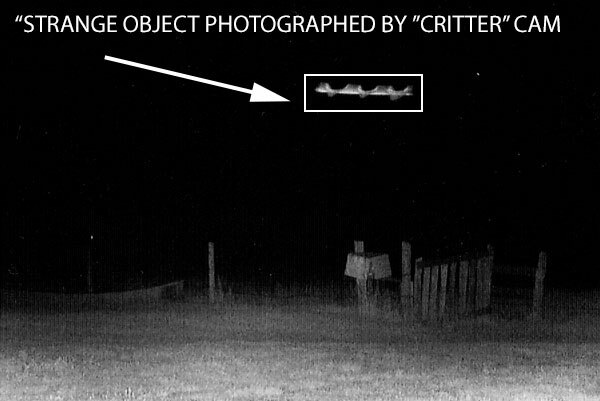 Description: A man found a strange object in the background of a photo taken with his “critter” (game) cam. He sent the photo which was scanned. He stated that the small gate and box in the photo is about 80 feet from the camera. Note: The object in the photo is likely an insect. The long exposure of the camera set at night produces a multi-second shot of the insect. This entry was posted in Discovered anomaly in photo, Photos, Possible Insect, Strange Shaped, UFO Sightings 2018, UFO Sightings Saskatchewan Canada. Bookmark the permalink.